Raja Ampat islands is a series of four adjacent group of islands located in the westernpart of the Bird’s Head of Papua Island, the fourth group of islands, which are WaigeoIsland, Island Misool, Salawati Island, and Island Batanta. Raja Ampat islands is a placethat has the potential to serve as a tourist attraction, especially diving tourism (diving & snorkeling). 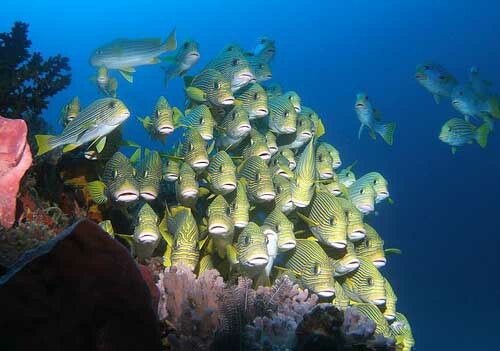 Raja Ampat Islands waters according to various sources, is one of the 10 best watersfor diving sites around the world. In fact, it may also be recognized as number one for the completeness of underwater flora and fauna at this time. Raja Ampat islands has a white sandy beach that is smooth and beautiful as well as with thecharm of a beautiful sea, the sea is dominated by the color green, blue andputih. Colors are the caused by underwater coral reefs are shallow or deep.